If you’re still searching for a brilliant stocking stuffer as Christmas looms large, then this dough is just the ticket. A beautiful sensory product, these aromatherapy doughs can aid children in calming down before sleep, ease car sickness and even soothe sickness. Intrigued? Read on. If you’re an aromatherapy convert you will need no convincing that this dough, which has just hit the Australian market, is the bee’s knees. But if you’re not, simply think about how a scent can have so much impact on how you’re feeling. A smell can bring back a memory, ease ill feelings and instil calm. And therein lies the magic of Mohdoh for Kidz. 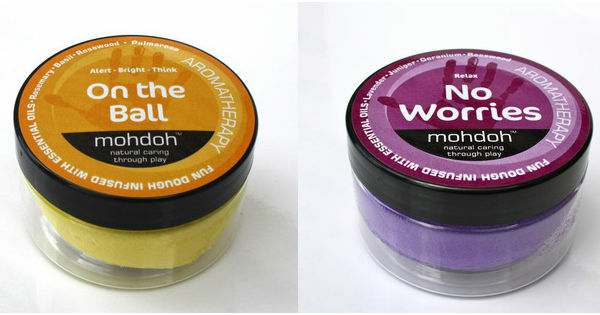 Mohdoh is a really clever idea – combining aromatherapy, colour therapy and play therapy. As children kneed the dough it releases the scent of the essential oils within, and they are inhaled by the child and absorbed through the skin. The creators of Mohdoh say the concentration of the oils is carefully controlled, meaning the dough is safe. There are six different doughs available: Zzzzzz to help with sleep issues, Chill Out to help kids calm down, Breathe to ease head colds, On The Ball for kids that need a bit of a lift, Travel Time for travel sickness and No Worries for anxious children. This product helps kids in several ways – by distracting their minds, engaging them in play, using their senses and just the pure enjoyment of a new play experience. And in all honesty, I think these tubs of dough are also great for adults. Some time spent playing with On The Ball on a work desk would no doubt banish that afternoon slump! In fact, you don’t have to borrow the kids’ dough, as there is an adult version of Mohdoh. Mohdoh for Kidz is available locally from Kids On Abington for $14.95 a tub.